Whew! It’s nice to be able to say that without a certain social media site throttling back my reach! I just LOVE a good sale! It gets difficult to see so many beautiful designs out there and I WANT to support each and every wonderful designers that I have grown to love, and I do buy when I can. Probably too often if you asked my husband. 🙂 But it gets difficult around the holidays. This is the perfect opportunity for you to show the designers that you love, that you support them, you love their work and you want to see more! and if you see something you like on Ravelry, add it to your favorites by giving it a <3! Nothing tells a designer you love her work more than interaction on social media! If you want to go above and beyond, you could share this link and get their sale out there! I know I speak for all of us here on this list when I say THANK YOU! You give to us all year long with your words of encouragement, your loyalty and your shares! This holiday season, allow us to give back to YOU and show some of our appreciation. This is the only way we know how! THANK YOU! First, let me tell you about my deal! pattern for free to the first 100 customers who come across it. To get the coupon code, see this blog. All patterns, including the advent calendar are $2 until December 1st at midnight, CST. No coupon code for the $2 sale! All patterns are $1 each in any of her stores. No coupon codes needed! All patterns 50% off! Sale ends December 1st at midnight, CST. Visit this blog for the coupon code. All patterns $1! Sale ends December 1st. No Coupon Code needed! 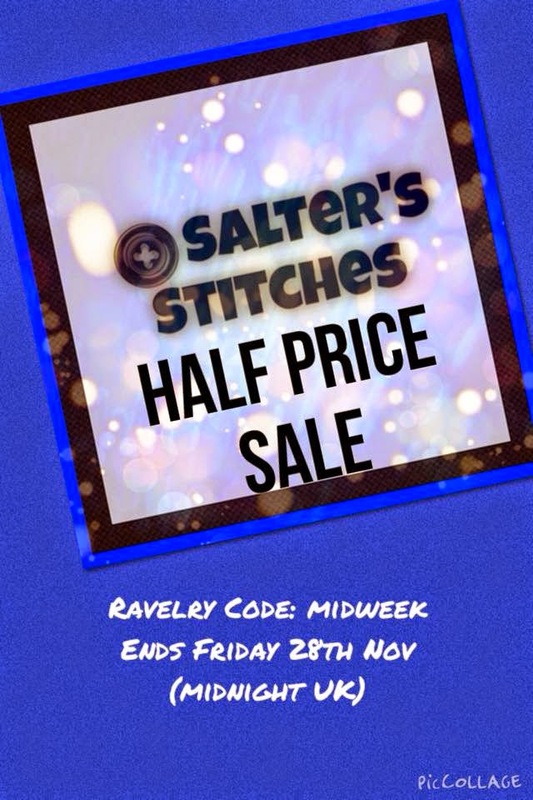 25% off all patterns in Ravelry. No Coupon code necessary! Visit this blog for more sales opportunities and the coupon code! 50% off all patterns! Sale ends Nov 30. No Coupon needed! Drill and 1/8 inch drill bit for drilling a hole into either side of dowel rod. This pattern includes detailed photo instructions on how to work hand tools! I figured if I was going to be thorough, I may as well include the simple details as to how to hang your calendar using a dowel! I was VERY overwhelmed by this. So overwhelmed that I didn’t hang my advent calendar for a whole year! It took all of 5 minutes to hang it and I was kicking myself for not having done it sooner! Most advent calendars are either the pocket kind OR the kind that you hang items onto. I made this calendar so that it can be versatile and hopefully over a 5 year stint you can have a different advent calendar experience every year! I didn’t want to have to make a new one every year and no other advent calendar that I could find had BOTH options. This calendar even has a pocket for the back, so that once you write the daily activities or scriptures on the tags (and don’t forget to number the backs of the tags as to what order the go in) you can stick each set into a plastic baggy and store them with the advent calendar so they don’t get lost! You can count up or down, meaning start at day 1 for the first day and count up to day 25, OR you can start at day 25 on day one of December, and count down to the #1 pocket for Christmas Day. You can utilize the buttons on the tree for hanging items like small ornaments. You can hang tags that you would use at a craft show that you can write bible scripture on or different activities to do each day up until Christmas. You can use the pockets to hold the tags and candy; to get the candy you must read the tag. Or you can have the tags hanging on the buttons and stuff them into the pockets when you’re finished reading them. You can utilize the pockets only for candy and the buttons can be just for decoration.